Feaster’s Tricks assures a correct position for your fingers when holding the sticks. It allows you to learn how to use traditional Asian chopsticks quickly and effectively. The skills are acquired subconsciously, which means on a deeper lever of knowledge. Scientists take a lot of interest in chopsticks. First of all, they develop our fingers. 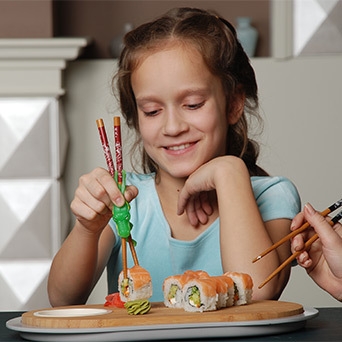 According to Japanese scientists, when we eat with chopsticks, we use 80 joints and 50 muscles of the shoulder, forearms, palm and fingers, as well as our brain. 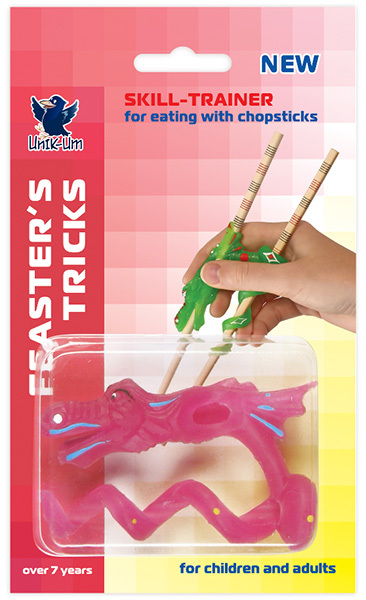 So eating with chopsticks not only develops manual dexterity but also trains our brain. For many Asian people, chopsticks are an integral part of life. It is remarkable that they became a symbol of economic prosperity that was first felt in Japan and then South Korea, Taiwan, Hong Kong, Singapore, and, since the eighties, continental China. The chopsticks are also used in Vietnam and Thailand for noodles and soup. Recommended for children over 7 years old and adults. Scientific fact: eating with chopsticks trains your brain.